We are barely a week out from the Kick Off press conference that announced the Cinco De Mayo rematch between Gennady Golovkin vs. Canelo Alvarez and controversy has already reared its ugly head. Simply put, Canelo tested dirty for the banned PED Clenbuterol. The drug can burn fat, build muscle and improve performance. It’s pretty easy to understand the concern. In the body of a world class boxer the drug known in athletic circles as “Clen” can be a deadly proposition. I then mentioned to Loeffler that chat rooms and message boards across the internet where crying “Bull”, (pun intended), to the claim that Canelo must have gotten that dose of Clenbuterol while ingesting some tainted Mexican meat. 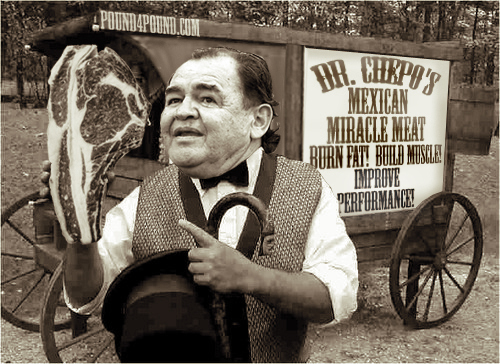 At this point it’s hard to imagine this will put the Block Buster Event in any jeopardy and barring Canelo being served up another plate full of Clenbuterol Carne Asada it’s doubtful any of his upcoming tests will show any signs of PED’s and the fight will go on as planned. If I was running the show down South pollo y pescado would be the main dish of choice until Team Canelo make their way north of the border. The most anticipated fight of the new millennium and you want to play around with tainted meat stories? Just giving you the benefit of the doubt, have you not seen this same story in Mexico often enough for you to be just a tad more careful than this? We have literally two months to go for these guys to settle the score. Let’s hope this is the last we hear from either camp for the next few weeks. This entry was posted on Tuesday, March 6th, 2018 at 3:23 am	and is filed under Boxing. You can follow any responses to this entry through the RSS 2.0 feed. Both comments and pings are currently closed.